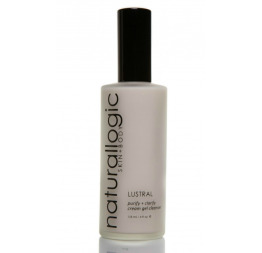 Multitasking, deep cleansing, exfoliating, nourishing and rejuvenating, it thoroughly removes makeup, daily grime, environmental impurities and protects skin's natural barrier while keeping inflammation at bay and infusing it with antioxidants, vitamins and moisture, leaving skin smooth, soft and truly clean, without drying. Your ritual begins with color, texture and scent. Delicate, pale pink, silky lotion glides easily over skin as the aroma begins to unfold. Light, fresh cucumber, with gentle undertones of warm vanilla, lemongrass and faint hints of ginger. As you cleanse, it transforms into oil, reaching deep into pores to decongest and purify then finishes as a creamy, enzyme activated milk, uprooting any lingering impurities. And especially beneficial as a protective and restorative daily cleanse for skin with sensitivities, dryness, dullness, hydration imbalance, malnourishment, barrier loss or dysfunction, or that is in need of environmental protection. - follow immediately with mist, facial oil and moisturizer. Store in a cool, dry environment, away from heat and direct sunlight. UNVEIL is naturally well preserved and has a shelf life of 2 years, but it's most beneficial to your skin if used consistently and as directed, from the day you receive it. Our skin + body care is made fresh from vibrant, food-grade ingredients, and the botanicals + nutrients serve your skin best if used while at their freshest. Aloe Vera Juice*, Sunflower Seed Oil*, Grapeseed Oil*, Papaya Seed Oil, Vegetable Glycerin*, Decyl Glucoside, Cetearyl Olivate, Sorbitan Olivate, Apple Juice*, Pineapple Juice*, Leucidal Liquid (Radish Root Ferment Filtrate), Cucumber Seed Oil, Kaolin Clay, Cucumber Extract, Chamomile Extract*, White Willow Bark (50% Salicylic Acid), Rosemary Extract CO2, Pink Clay, Xanthan Gum, Lemongrass Oil, Vanilla Absolute, Ginger Root Oil.